The Universal Soldier. The Prince of Swords is the god of war. He is not the strategist, the general, the officer in charge--he's the guy out on the battlefield, hacking away; he's the useful but expendable knight in someone else's chess game. 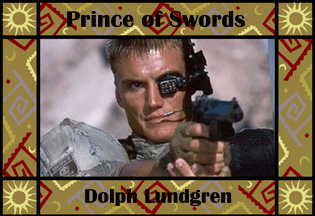 Dolph usually figures out by the end that the folks he's been killing for aren't exactly the good guys after all. But not until there's blood and bodies strewn everywhere. Dolph charged out from the Dolph Gallery.